As I cooked salmon for dinner yesterday I stopped to think about the meatarian hubby. He’s away in the countryside shooting vapid models in a remote castle, complete with falcons, doberman dogs and a hot air balloon. Fairly dull compared to my average day jostling armpits on the underground and irate clients at work methinks. I frequently get asked “don’t you get jealous of the models?” But of course I do. Who wouldn’t want to be stuck in the freezing cold with no mobile phone reception, skimpy clothes for protection and nothing but a celery stick for dinner? I deal with it all the old fashioned way – targeting the tube that leads from his stomach to his heart. Before he left, I made him a veritable weekday feast using a recipe from Meena of Hooked on Heat. 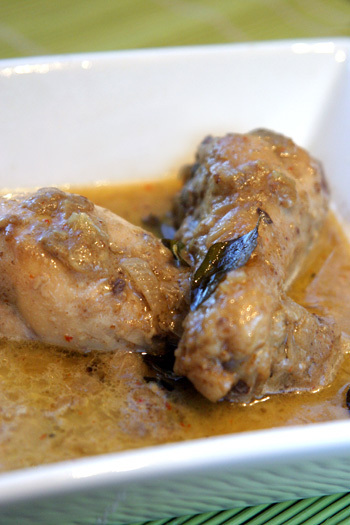 It was a coconut chicken curry, I was instantly drawn to because hubby loves both coconut milk and curry leaves. Besides, it sounded super quick to make. The only small change I made to the recipe was using chicken drumsticks, because I hate cooking curry with chicken breasts. It hit the right spot for hubby and made me quite smug too. Next time, I will try this with diced thigh to cut cooking time even further. Set a medium pot on a high flame and when hot, dry roast the coriander, cumin seeds and dry red chillies. When you can smell their heady aromas, take them off the heat and grind them into a paste with a tablespoon of warm water. This is much quicker than trying to turn it into a smooth powder with a blunt blender. In the medium pan, fry the onions, garlic and curry leaves in hot oil until the mixture turns a warm golden colour. Now add the turmeric, spice paste and green chillies and fry for five minutes. Then chuck in the chicken and vigorously incorporate the masalas into it while browning the chicken evenly. When it is well sealed, pour in the coconut milk. On a medium flame, cook the chicken for half an hour until it is done. Serve it hot with some rice or rotis. I am a great fan of chicken and coconut, so I’ll try this one out in the weekend. am using breasts though, I like them better than drum-sticks. I will let you know how they were! Awesome Writeup! Meena’s stuff is too good. I’m sure there are many reasons your hubby comes back home to you!!! Heheh… I love sarcastic posts and this one ranks with the best of ’em! 🙂 Nice read! A fuuny post and a good recipe. I love sarcastic humour. This is a funny post and an awesome recipe. This is first time here n i loved it. Sure to be regular here. Ah! Loved reading that- and I gotta go look up vapid in the dictionary now…thanks for adding a word to my vocab- Have a good weekend Mallika! This looks delicious! Will definitely try this within the next few days. And I love drumsticks so will stick to that. Thanks for your comment on my blog at http://bordeaux-undiscovered.blogspot.com – you took a little finding as the link did not work to your site! I am glad you are enjoying my blog – and I am extremely pleased to have found yours! Many moons ago I used to be a chef and my love of food combines naturally with my love of fine wine. I would be delighted to suggest some wines to accompany your recipes – and would love to feature some of your cooking on our site – my readers would be very interested as I often get requests for Indian recipes and what is best to drink with spicy foods. First, does your husband need an assistant? Second, do you have any sisters? model wife indeed, I have no doubt 🙂 the chicken looks delicious BTW. Mallika, I tried this one out today and was thrilled to bits that it turned out just like the photo. I ate so much that I had to roll myself over to my machine to say thank you. This was so simple to prepare and a big hit with all my family. Really delicious, – after making this dish, I realised I can cook! I will be visiting again soon. Thanks Mallika.